We take a look at the spooky, moving 1970 musical version of A Christmas Carol, SCROOGE starring Albert Finney and Alec Guinness. 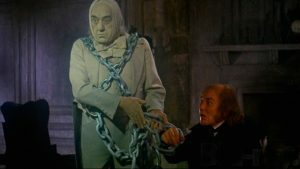 These are some amazong performances and most of us were bowled over by how moving a version of A Christmas Carol can be. The Team: Hosted by Jason Henderson, one of the writers for Bungie’s Destiny 2: Curse of Osiris and creator of the HarperTeen novel series Alex Van Helsing. Featuring Drew Edwards, creator of Halloween Man, Tony Salvaggio, Tech Director at of Rooster Teeth Studios and Clockwerx from Humanoids, attorney Julia Guzman of Guzman Immigration of Denver, and Jamie Bahr, lead singer and upright bassist of the rock and roll band Danger*Cakes.